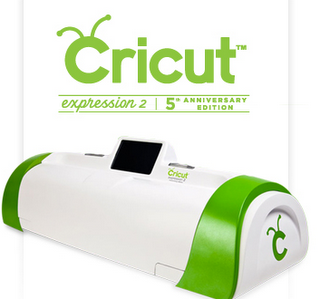 EveryDay Cricut will be giving away a new Cricut Anniversary Expression 2 on Monday night, during our live Ustream event, starting at 8:05 pm (central time)! 1) Leave a comment here telling us your favorite Cricut cartridge. See HERE on how to leave a comment if you don't know how. 2) Follow or subscribe to us! 1) For five more chances, blog about this giveaway and leave a link in a comment. 2) For five more chances, put our badge on your blog and leave a link to your blog in a comment. 3) For five more chances, tweet about us and leave a link to your twitter name. 4) For five more chances, facebook about this giveaway and let us know in a comment. 5) For five more chances, "like" us on facebook by clicking here. This means you could have up to 26 entries into the contest! We will be taking entries up until 6:00 pm Central time on Monday, April 25, 2011. Then, we will announce the winner during our live Ustream event starting at 8:05 p.m. central time on Monday, April 25, 2011! We will also post the winners' names on our blog after the event. Everyday Cricut will have even more giveaways we will award during the Ustream, taken from these comments in this post. Stop by Everyday Cricut and check this amazing giveaway!!! I don't have favorite cartridge! I love them all. I saw that on EC..that's something else.. nice giveaway.. I've got to get myself over there and get on this.. LOL Hope you had a great easter! Pixie Dust Studio Challenge #70 Say It out Loud!